Hear the report on the exhibit by KUAR intern MaKayla Ealy. Guests at the reception for the exhibit On Their Own Terms on Feb. 1. An exhibit celebrating black art is now on display at the University of Arkansas at Little Rock. 37 African-American artists and about 50 installations are included in the show On Their Own Terms which features vintage works of art alongside contemporary works. Brad Cushman, gallery director at the Windgate Center of Art and Design and curator of the collection, says assembling the pieces took years, but was worth the effort to showcase talent that has often been overlooked. He says the title came from conversations about who gets to be an artist and how classical artists like Robert Duncanson and Charles Porter were making art on their own terms despite the hardships that came from being free black painters in the 1800s. Cushman held a reception for the works on February 1. At least 100 people gathered to behold an evolution of about 150 years of black art in America. The collection brought a diverse crowd of spectators to view the exhibit. A guest at the reception looks at a figurine called Jar Woman VI. Cushman spoke about meeting Dr. Patricia McGraw before the reception. In 1971 she was the first African-American professor hired by Little Rock University, which is today known as UA Little Rock. Cushman characterized the retired professor as having so much dynamism and energy that he was envious. He says people from the community have continued to come see the exhibit, then stay and share their stories. 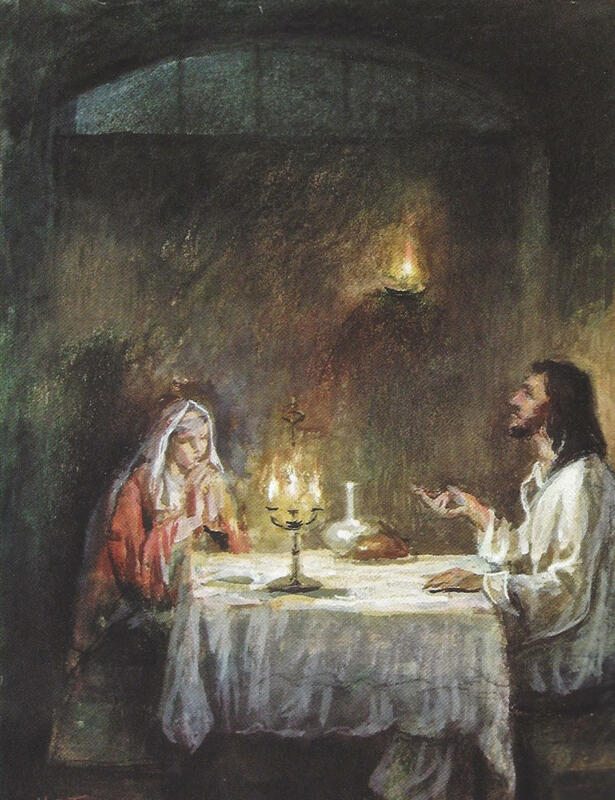 Henry Ossawa Tanner's Jesus at the Home of Mary. Pieces were loaned from private collectors across the country, the Arkansas Arts Center and the UA Little Rock Permanent Collection. Juan Rodriquez is a private collector who shared many of the classical pieces by Henry Ossawa Tanner and others with the gallery. After his close friend Bruce Llewellyn approached him about acquiring a collection of African- American Art for a children’s museum in Philadelphia, Rodriquez says he became infatuated with the works and began building his private collection. Rodriguez says he’s glad he was ahead of the curve as black art begins to become more mainstream, but is even happier that these pieces are getting their time in the spotlight. Rodriguez says museums are now trying to buy up black art to fill gaps they have in their collections. He actually draws light. And so If you see the original one, it’s just amazing because, it’s like, how can somebody draw light? Pamela Vance is another collector who decided to lend a personal piece to the exhibition. Featured is a sketch used by Tanner in preparation for making his painting The Annunciation. Vance says she was so struck with awe by the famous piece that she eagerly purchased the sketch. "He actually draws light. And so If you see the original one, it’s just amazing because, it’s like, how can somebody draw light?" Delita Martin’s installation, The Dinner Table, succeeded in its mission to evoke fellowship. Upon walking into the Brad Cushman Gallery there is a very well-lit corner where 200 plates cover the walls surrounding a white table with six white chairs. Each plate holds the face of a friend, a family member or any woman Martin felt a connection with and was compelled to portray. Delita Martin's installation The Dinner Table. Martin says each time she shows the installation the experience is different, but one thing is the same "they always pull me to the side and they say 'Why am I on the wall?' and I get to share with them that moment that they made me feel good, or what it is about them that stuck with me." During the reception Martin recalled her inspiration for the project to one group after another. Upon observation patrons seemed almost compelled to talk and share in the experience together. When strangers approached the installation, they sat at or around the table and without fail would strike up a conversation with another viewer. Often the great detail of the portraits would be discussed, or the way the style of the plate itself seemed to perfectly complement the face it held. This was happening all over the arts center; little groups of people forming and dissipate in front art work that’s rarely given a stage so large or the chance to be viewed by such an assorted audience. In the Windgate Center there is a mask made by folk artist Bessie Harvey in 1994 next to a classical oil painting by Robert Duncanson that is well over 100- years- old. Robert Pruitt’s Black Jesus is next to a very traditional Jesus at the Home of Mary by Henry Ossawa Tanner. 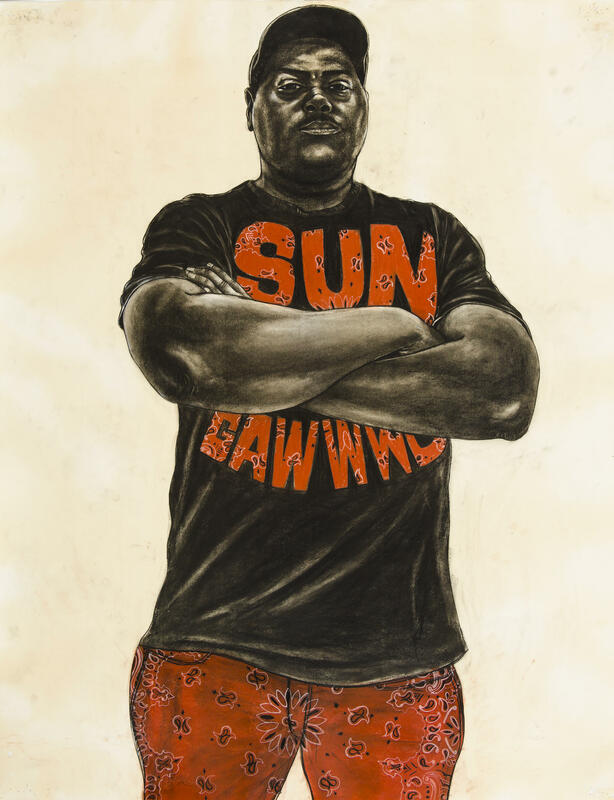 Cushman said he sought to activate historical pieces with contemporary exhibits and succeeded in bringing together patrons from many different walks of life to celebrate an ongoing evolution of black art. The exhibit runs through March 10.